Five years ago, the housing market was in such bad shape in Miami that developers stopped building. Today, 94 towers are under construction–three featuring penthouses with price tags of $50 million or higher. Two with similar list prices have already gone into contract. Before the current $50 million penthouse boom, Miami’s highest-priced home traded hands for $47 million when a Russian to acquired an Indian Creek compound back in 2012. That deal is, in fact, still the highest closed sale on record–and was for a 30,000-square-foot single-family home set on two acres, not an apartment. To date no condominium has closed anywhere near that record price. The highest recorded condo sale for Miami is the $34 million paid for two triplex penthouses–spanning a 16,271 square feet across three levels–at The Residences at Miami Beach EDITION, the hotel-condominium by Studio 54 cofounder-turned-hotelier Ian Schrager. But neither record will stand much longer. Faena House, a luxury tower designed by starchitect Norman Foster, is under contract for a figure north of its $50 million list price; it’s practically common knowledge in Miami that the 18,253-square-foot duplex penthouse fetched $60 million, though that can’t be confirmed until the deal closes. Regardless, Faena has been a big hit, selling out to buyers including Lloyd Blankfein, Larry Gagosian, and Leon Black. The penthouse buyer remains a mystery. Now, more developers are trying to ring in similar sales. In addition to the three listings of $50 million or more, a fourth luxury penthouse is listed at $45 million; three more have price tags of $40 million. “When the owners of these properties see and hear what something has sold for, everybody thinks theirs is the best–so the numbers go on accordingly,” explains Jill Eber, half of the power broker duo The Jills. Developer Ian Bruce Eichner is the latest to get into the game, announcing in early January that his four-floor penthouse at the Continuum South Beach 2 is for sale with a price tag of $50 million ($4,519/sf). 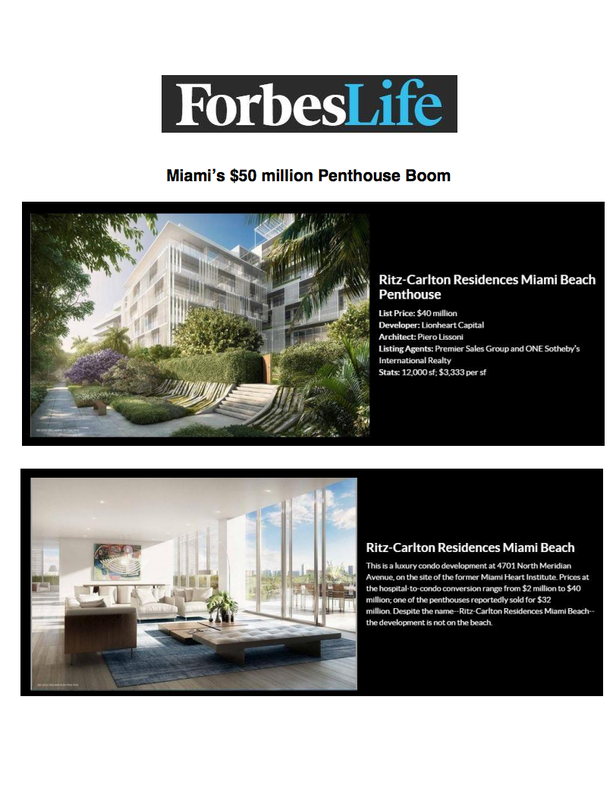 The apartment was built more than a decade ago, in 2002; its price tag reflects a $5 million (optional) overhaul by high-end Miami-based interior decorator Steven G.
Developer Don Peebles has priced his Bath Club Estates penthouse at $50 million ($5,435/sf). The 9,200-square-foot triplex penthouse comes with its own private pool, and tops a building that has only 13 residences. Separately, Peebles is marketing two second- and third-floor duplexes as a single 18,000-square-foot mega complex, listed together for $44 million. Douglas Elliman’s Chad Carroll and Chris Leavitt, stars of Bravo’s Million Dollar Listing Miami, share the listing. In addition to the $50 million (list price; $2,739/sf) penthouse at Faena House, two penthouses priced similarly at the Mansions at Acqualina have already sold, though the buyers and exact prices remain unknown. First marketed as “Palazzo d’Oro” by the Trump Group (no relation to Donald Trump), the 46th and 47th floors were combined into a duplex and listed for $55 million. When a buyer wanted just the 47th floor, the developer repackaged the 45th and 46th floors as a separate duplex penthouse, “Palazzo di Ricchezze,” which was listed for $50 million (at 15,000 square feet, that would be $3,333/sf). That unit has also sold. Brokers say that global economic instability—plus New York’s cold winter weather—will take care of the priciest units that are still up for grabs. Hedge funders from New York as well as South Americans, Asians, Russians, and Europeans looking for safe harbor for their money make up the ultra-high-end pool of buyers. “We’ve seen a general trend of people looking for larger apartments,” says Jeff Miller, the Zilbert International Realty agent who brought the buyer to Faena penthouse. “A lot of our clients have asked us to help them acquire the apartment next door.” His gets inquiries from Brazilians, Venezuelans, Argentines, Italians, Russians, Turks, and Americans, many from New York. Over the past decade, Miami has gained attention as a destination that can attract the world’s rich, thanks to its luxury high rises, beach climate, and attractions like Art Basel Miami festival. Knight-Frank’s ranked Miami 7th in its 2014 annual global cities, based on economic activity, quality of life, influence and political power, and the number of ultra-high net worth people who live there. Developers have also brought in famed “starchitects” like Norman Foster and Zaha Hadid in an attempt to attract high-end buyers to their buildings. This is a marked change from the height of the housing downturn, when building in South Florida simply dried up. The first condo tower to sell after the recession was billionaire Jorge Pérez’s Apogee Beach. Pérez, CEO of the Related Group of Florida, required buyers to put up 80% before the sale closed (which happens when the unit is completed and delivered to the buyer)—a previously unheard-of figure. But in the fall of 2011, the condos began selling, averaging just under $500 per square foot. Schrager’s EDITION followed (units are now being delivered), as did starchitect Richard Meier’s Surf Club, and Norman Foster’s Faena House—the development that has set the bar in terms of sales. Now, the Trump Group, which developed the Acqualina Resort and Spa on the Beach and the Mansions at Acqualina, will price its 13,000-square-foot penthouse in its next development, the South Tower of the Estates at Acqualina, at $40 million ($3,077/sf). A 10,500-square-foot penthouse at PMG’s Echo Brickell in downtown Miami recently upped its list price to $40 million ($3,810/sf) from the original $37 million. Starchitect Zaha Hadid’s 15,700-square-foot penthouse at One Thousand Museum, also in downtown Miami, was bumped up in price from $45 million to $49 million ($2,866/sf) in November. Finally, the 10,000-square-foot penthouse at the Ritz-Carlton Residences Miami Beach is also listed at $40 million ($3,333/sf). As condo prices have risen, so have the number of Miami-based realtors: from 24,000 in 2009 to 35,000 at end of 2014, says Peter Zalewski, a former journalist who tracks condo projects and sells the data via his consulting firm, CraneSpotters.com. Since 2011, 316 South Florida condo towers–with some 40,600 units in Miami-Dade, Broward, and Palm Beach counties–have been announced, according to Zalewski. Developers have completed 20 condo buildings with nearly 1,200 units, and another 94 towers with 11,600 units are under construction. “I am still bullish on the South Florida preconstruction condo market as I think a number of these projects simply won’t get built for a number of reasons including the amount of information that is currently available,” Zalewski said via email. It’s not just condominiums setting record list prices in South Florida. At $139 million, Le Palais Royal in Hillsboro Beach (halfway between Fort Lauderdale and Boca Raton) is currently the most expensive home for sale in Florida, and the third-highest listing in the country. Higher price tags still belong to the Hamptons’ Briar Patch Estate, which is listed for $140 million, and to Jeff Greene’s $195 million Beverly Hills spread, Palazzo di Amore.